View More In Lighted Holiday Displays - Page 11. Starburst lighted branches may be the most versatile lit decor items you've ever tried! 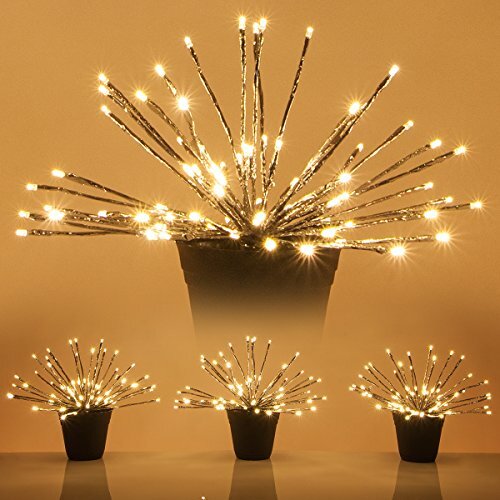 Like delicate fairy light balls, with 5mm LED bulbs at the tips of the branches, these lighted branches can be used as light balls, or bent and reshaped to be used as LED vines and LED branches. Or suspend them from the built-in hook and use them as star lights. They can serve as Christmas light balls and Christmas decorations, Halloween decorations, starburst lights and more. Use by themselves or mix with other decor in urns and vases for beautiful decorative accents for home or office. Set of three branches; branches are fully shapeable. Energy efficient LED lights remain cool to the touch; if one light goes out the rest stay lit. If you have any questions about this product by Wintergreen Lighting, contact us by completing and submitting the form below. If you are looking for a specif part number, please include it with your message.